Everyone needs a coach…even coaches need a coach! They plan and push you sensibly and they help you reflect on the positives as well as what you can improve on. It wasn’t until my good friend and coach Rene Borg said, in a WhatsApp message over Christmas, that it’s probably been my greatest year of running so far. I hadn’t really thought about it until I wrote this summary of my races in 2017. Now I can see it really was a remarkable year for my racing. So thanks to my coach Rene, my fierce competitors, clubmates and not to forget my ’emotional coach’ Ann who has been there every step of the way! The key to my success was staying injury free so I could consistently train using clever programming. 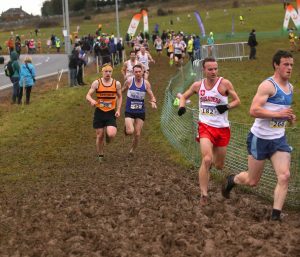 I had three peak racing periods planned, Ballycotton 10mile (Mar), Irish Trials & Mountain Running Championships (5 races, May-Aug), and finally the National Novice Cross Country (Dec). I headed into the new year feeling great. There was a large bunch in the club entered into Ballycotton 10 and I wanted to have a stab at the ten mile distance on the road. I had a good eight weeks training leading into it and only missed a weeks training just before the race due to a tight calf that just wouldn’t release (too much training on soft grass), but besides that there was no issues. A tough distance and it just about worked out OK. Myself and Michael O’Connor (57:41) were of similar fitness levels and we worked together for the first 5 miles before my impatient surging from group to group punished me. My pace dropped and then I dropped off Michaels shoulder at a water station around mile 7. The last three miles were a real grind losing 13 places and 45sec to Michael. It was great to tackle a new distance on the road and getting the top 100 red t-shirt. 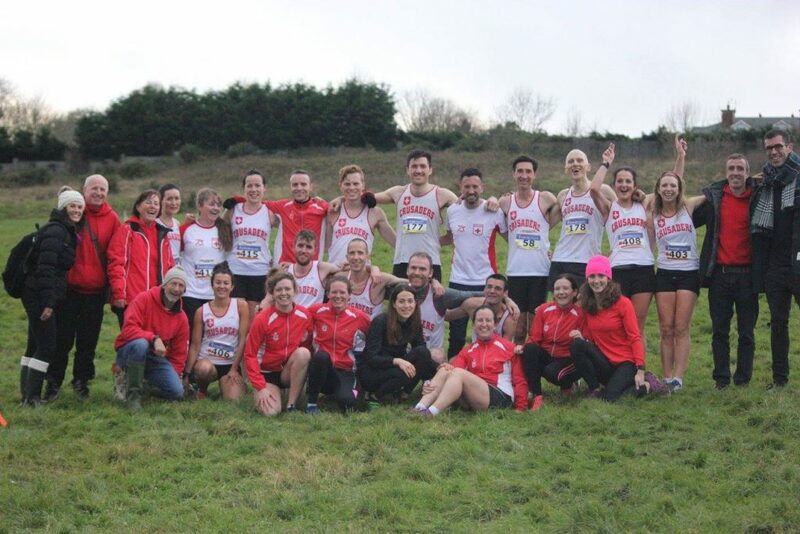 Subsequently it turns out to be the last Ballycotton 10 ever to be held! End of an era in Irish road racing. This race taught me to never surge in the middle of this distance, no matter how amazing you are feeling…you will suffer later! Also that I should wear more cushioning in my road race shoes over longer distances. The distance and pace had my feet quite tired in the Vivobarefoot shoes about 7miles in. Currently experimenting with other road race shoes for Berlin Marathon 2018. First mountain race of my 2017 season. After missing the 2016 season due to a bruised calcaneus (heel), got from jumping from a small cliff trying to stave off Adrian Hennessy at the Ballybraid race (May ’16), I was sidelined for 3 months having been not able to walk without pain, never mind run. 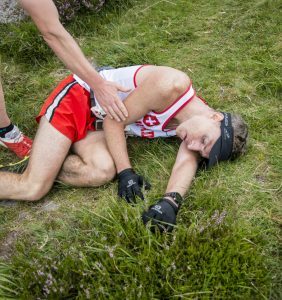 I wanted to reclaim the Irish Mountain Running title which I had won in 2015. Tonelagee was to be a workout race to practice my ascending ahead of the European Masters and the Slieve Donard trial race. 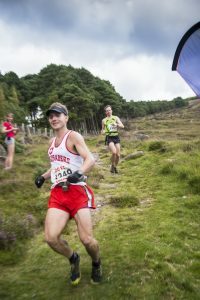 I took my own ‘off-road route’ and climbed aggressively, but it was a poor route choice across deep heather and bog and I got to the lake in 9th place having been leading the race at the start of the climb. I did manage to salvage six places but too little too late and a stitch (first of many in 2017) on the downhill had me coast down it, 52 secs behind Adrian and Bernard. Remind me to recce these routes in the future or to follow the pack if I don’t know the optimal route! Great to be back in the mountains! My first run for Ireland in Masters (M35) and on the European racing scene. Great experience and well organised event and I got to wear an Irish Singlet again which is always special. Cautious start through the town (3:30min/km) but I paced the race well once I settled on the climb and then finished the race strong. Probably left a few scalps out on the course because of the cautious start. 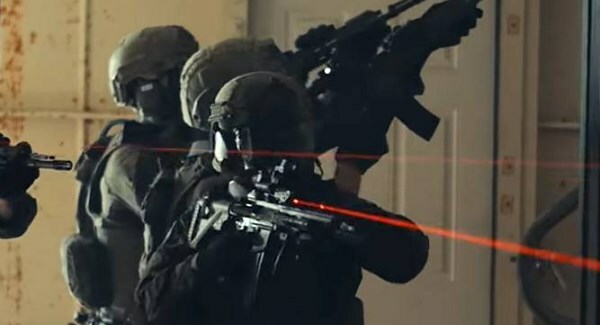 I should have latched on with a group that I thought was just out of my comfort zone. Myself, Ian Conroy and Brian O’Murchu won a European team silver medal. They don’t come too often in your running career I’m told! My brother Devin and his family live in Barcelona so I was able to double up the trip as a holiday as well. My ‘A’ race for the summer and I was proud of getting to the start line in great shape after 5 months preparation. Periodisation does work if you believe in the process and do the simple things consistently. 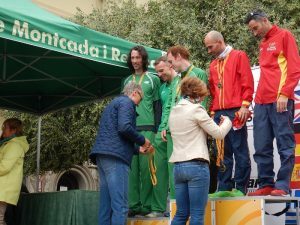 I was focused on trying to make the Irish Senior team for the European and Worlds Mountain Running Championships. This was the first time I’ve turned up to a trial race in great condition and with no excuses. The Irish Champs and the Irish trial race was combined as an experiment which IMRA were trying out. For me this was great because it’s next to impossible to compete in the Irish Champs and also be in good condition for a trial event with races usually just a week apart. I could kill two birds with one stone now. The first 6 runners to the summit and first 4 runners to finish the course would make the European and World teams respectively. I arrived to the start line in excellent shape but it wasn’t to be this year. I climbed very well but got a stitch at the saddle between Slieve Donard and Commedagh. I struggled with stitches on my right side quite a few times in 2017. I had to back right off the pace on the final climb and concede two places to William McKee and Brian Furey. At this stage I had to recover and finish the race strong. Ascent time 40:42 (9th to the top, needed 3 more scalps for selection!). I made places up quickly on the descent, taking Brian Furey, Mark Ryan (Rathfarnham) and Ian Conroy (Raheny) but I was soon by myself and had no one to keep the pace up with as no one was visible. I should have been a lot faster here. I was 6th place to the final forest just before Newcastle when I had a bad fall on my hands, where I thought I had broken one of them at the time. I was passed by two runners shortly after this (Hicks and D. McGee) finishing 8th overall in the end and was 2nd in M35 category. Descent Time: 23:00 mins (13th quickest), this most definitely needs work! 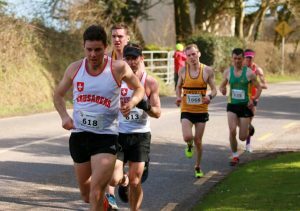 I was 3rd IMRA man finishing 121 secs behind James Kevan (Clonliffe) who descended well (32 secs faster than me) and 65 secs overall behind Brian McMahon (Clonliffe) who was 1:51 slower descending than me, both athletes feature regularly at international level. So my descent really let me down, I’m a lot quicker than what I gave that day, I just need a hare to chase! However, this year William was a full 2 minutes quicker than me on the descent and finished in a great 2nd place! Chapeau! So I think if I had William or anyone else in sight (Ian conroy was my only distant visual) I’d have had a lot more to give on the descent. Plus falling never helps…write that lesson down! I had DOMS in my quads afterwards which lasted nearly two weeks, clearly not enough hard downhill conditioning leading up to it as I had no problems for the rest of the season. 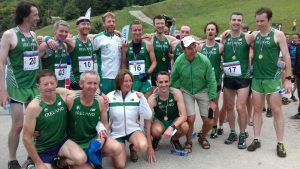 With my result I was offered to run on the Snowdon International Irish team and wear an Irish vest again but myself and Rene felt the timing wouldn’t help me with my secondary goals of the season, to win back the Irish Championships. The 5 mile up and 5 mile down Snowdon are very taxing and Croagh Patrick and Lugnaquilla races were sandwiching it. 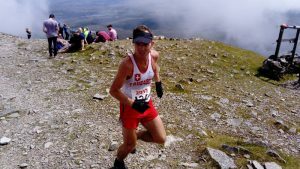 I had already done Snowdon before in 2010 and performed well having been on the Irish B team and surprising everyone to finish as first Irishman home. There might be time to give Snowdon another stab in the future hopefully. I’d like to dedicate this win to Michael ‘Curley’ Cunningham (RIP) from Moore Abbey Milers A/C. I first met a smiling Curley on Carrauntoohil 10 years ago on my first attempt at Ireland’s highest mountain. Thanks for the great weather Curley, I was thinking about you on the climb. Returning to my favourite mountain after two years, last time I raced it in 2015 I was in great shape but lost the lead, finishing 2nd to Diarmuid Collins, due to a navigational error in thick mist coming off Caher (See this 2015 Strava flyby). This time I had company all the way to the summit with the aptly named Englishman Andrew Fleetfoot (West Waterford A/C). I hadn’t raced him before so was unsure what his pedigree was like. He was a good climber but he didn’t know the route and crossing the gnarly Cahir Ridge I realised I had the advantage on the technical descents. I absolutely love the dangerous rocky crag hopping. Reached the cross at the summit of Carrauntoohil in first place and then allowed Andrew to lead as I recovered. I bided my time until the final descent where I took the lead on the soft and slippery stuff winning the race with Andrew a minute behind and Bernard Fortune charging just behind him. I was 2:17 off my best 2011 time when I first won this race. With over a month to the next Irish Championship race I needed a few similar secondary races to keep me sharp in between. Djouce was the first of the training races. 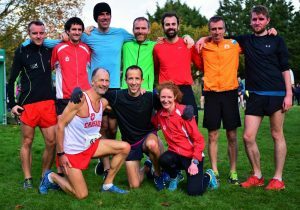 I haven’t really ran too often in the Leinster League since I began training for the championship races, it’s quite hard to do both and it would be a lot of racing over a short period of time. It was a lovely evening and had a few of the usuals to keep me on my toes. I climbed very strong and then took it handy on the descent once I knew I was out ahead. The ‘Abyss’ descent through the forest was great but I had pretty much no grip on my Vivo trail shoes, its super steep stuff and plenty of opportunities for impalement on the many sharp branches! The final part of this race through the forest is brilliant and the heartbreak hill at the end is just enough to leave a lasting impression when it’s all over. Another training race between the IC’s. One of my favourite descents as it’s grassy and fast. Nearly missed the start as we parked at Glendalough upper lake so we could warm up. Had my first encounter with eventual Leinster League winner Michael McCarthy (Liffey Valley A/C). Tough climb where Michael was using a run walk strategy very effectively across the hard going heather. He reached the summit first and I slowly reeled him in on the downhill before we raced neck and neck downhill at 3:05min/km~ pace for about 2.5km. I made a decisive move at the final gate by vaulting it which allowed me to put ten seconds into him and coast to the finish, unbeknownst to me it was for a new course record. It may have been a training race but I worked very hard to wrestle it from Michael! Amazing hot weather that evening and had a swim and a beer worth waiting for in Glendalough Lake afterwards with Barry Murray and friends. JASON MAKES A SPLASH IN NATIONAL TRACK & FIELDIn just his second attempt at the steeplechase Jason continues his good form this summer placing 4th in the Premier Division Round 1 in Athlone IT running a time of 10:47 for the 3000m with 28 ordinary barriers and 7 water jumps to navigate through. In a very close finish (see video) there was just 1 second between him and 2nd / 3rd place finishers. "It was great to race in a track event which is not for the faint hearted and I managed to bag 5 points towards our clubs tally. You need speed, agility as well as power which suits my mountain running focus this year. I haven't had the opportunity to practice any hurdling and the water jump is the one where you have your fingers crossed as you approach it. The joke among steeple chasers is that every spectator is secretly hoping for a crash and a splash here! Luckily the worst that happened was I got was a little wet. The pace started fairly slow (my 10k pace) but as the laps went on the jumps took their toal, I think I certainly had more in me and I'd be keen to try a different pacing strategy the next time. 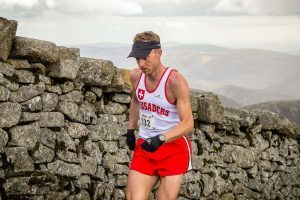 The last three weeks have been dedicated to practice races so now I have two weeks of 'ordinary training' before the Croagh Patrick Irish Championship race on the 8th July." My second attempt at the Steeplechase to get points for my club Crusader A/C in the national track and field competition, it’s an event that I really love to do ever since Gary Park talked me into doing it in 2014. I paced it well and didn’t die on the last few laps like I did a few years earlier. Myself and another two lads had a cracker of a final lap when I kicked on with 300m to go, I nearly caught the guy ahead of me and I was taken at the death by the lad behind me. Missed out on 2nd place by 0.56 seconds…welcome to track racing! My waterjump was very strong but I still need to place a foot on the rest of the barriers as I didn’t have any practice of jumping them clear at that height, you can actually see me comically taking the last barrier in one go. I’d really be interested in doing some specific training for this on the jumps and 3k distance some day. Really cool event! Reflecting on my race notes, the Steeplechase gave my right leg quite a battering. The 35 jumps and landing on the right leg (probably crappily) was tough to shake off. Straight after the race I could feel it on the Achilles, Soleus/Brevis/hamstring muscles. Gary Park asked that I give the Cru a dig out in the 800m shortly after. I ran it at a light jog pace in 3mins~ just to get us the two points, I finished 250m behind the rest of race! This was the beginning of a glute niggle that still sometimes bothers me seven months later unfortunately! Feeling really good this day and sufficiently recovered after a few weeks of easy running and minding the niggles from the Steeplechase. I was a bit surprised to see Brian Furey at the start line but I welcomed the challenge I knew he’d give. 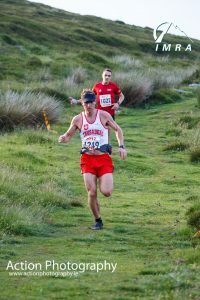 It was our second encounter in the Irish Championships having beat him by two spots and over 2mins on Slieve Donard in May. Brian is good on the climb and I have to hang on to him but I have the edge on the downhill, especially if it’s technical. Neck and neck to the final cone of the mountain, we had a bizarre battle where we were both sprinting up the mountain to gain control of the pace. Brian won out and it took me five minutes to recover from the effort, absolutely knackered but I managed to run the vast majority of the full climb. I had a great descent off the cone and made the time back up quickly. I was confident throughout the remainder of the race that I would take the lead, and so I did by the time we reached the final climb on Ben Goram. Even though I took the foot off the gas knowing I was safe at the end we both broke the six year old course record (Brians, 2011) by 30secs on this point to point route which was first ran in 2011, where I was 2:04 slower back then! Just shows that good hard honest racing with strong competition leads to new records. I should have wrapped up the Irish Championships this day but it wasn’t meant to be. A race I would really like to forget! It was a comedy of errors in my training the week before as well as during the race itself. The week before I had a Out & Back session (1/2 marathon effort) and the next day I did a 2hr fasted long run with the club at an effort higher than I should have. Then two days later I inadvertently did an intermittent fast i.e. didn’t eat for 18hours (I was busy!). I’m a big fan of fasted training and Intermittent fasting but during intense race season you can easily wreck your energy levels. Schoolboy error! Then on the wednesday I had the worst training run I can remember around the Phoenix Park, stopping seven times through the ‘easy’ 60mins. My energy levels were totally shot…I messed up and feared for the race the following Saturday! I took the next day off and only a light trot the night before with 6x 100m strides. Myself, Brian Furey and Michael McCarthy raced to the base of Lugnacolle and Brian was always in the lead on the climbs. I reached the summit in 2nd place about 30 secs behind with Michael on my heels. On the descent I was gaining on Brian fast but I took a terrible line down through a boulder field and lost a heap of time. Then I had, not one, but two ‘superman falls’ on the boggy surface (eating a mouth full of bog!) as I started to get tired, then a stitch (right side again) came on me and Michael passed me out at this stage. I made a late surge down the dangerously steep Camara hill and was within spitting distance of Michael but he put the afterburners on when we hit the last laneway and I conceded for a very tired and disappointing 3rd place. My fastest time on this mountain, 74secs faster than my 2011 time. Another two weeks to recuperate and wait to do the deed! An easy week of training and then I used the Park Run as a speed session. Myself and the class Louis McCarthy of Rathfarnham A/C (15:59) led out the start with Louis taking off into the distance. It’s a tricky course with a long hill at the start and plenty of twist and turns. It was my 2nd Parkrun ever (Tymon Park, 2014 in 18:04) and I hadn’t done a 5k distance since 2016 Irish Track and Field! A different kind of tough but not really enjoyable running by yourself! So four months of peak/non-peak racing, big goals achieved and a break was now long overdue. There is only so long you can hold your racing peak and my fellow coach, friend and business partner in ChampionsEverywhere, Rene Borg, managed the whole thing beautifully. Myself and Ann holidayed in Poland and then I did 10 days of my annual hiking trip with four mates from Austria (Daniel & Beno in pic) and Hungary (Tibor & Akosh) in the High Tatra mountains. I hiked over 130km and 12,500m of vertical climbing (everest is 8,848m). 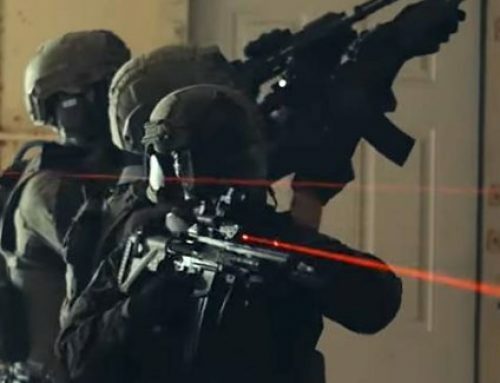 This type of holiday is also excellent strength training and the Japanese marathoners would hike for about 6-8 weeks with heavy backpacks before marathon base building. I was carrying about 13kg~ in my own pack and eating and drinking beer liberally! I had my hiking trip planned before I knew about the World Masters which just happened to be a two hour drive from where I was hiking in the High Tatras so I said I would tog out for it since I was in the neighbourhood. I’m glad I went along but really I was always going to be wrecked after all the hiking I did over the previous ten days. The legs were very heaaaavvvvy! I started in the lead bunch and in the first kilometer I was thinking, “huh, the legs aren’t so bad!”. Then, boom, we hit the start of the main climb (gentle as the whole course was) and the legs just refused to turn over. Oh well, I would keep a steady effort up but there was no flogging this dead horse. I dropped a load of places and managed to gain one back on the final steep climb from Brian O’Murchu (34:45 10k’er) whom I couldn’t let take my scalp…not just yet! We had a wild night in the local bar with the Irish team who managed to get a team gold in M35 category (Ian Conroy-3rd, Eoin Flynn-4th, Brian Furey-6th). 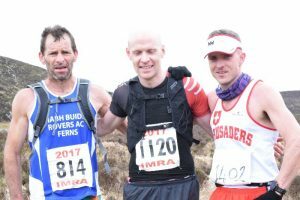 Des Kennedy (2016 Irish Champion) also won the M45 event which is a superb result and Ireland’s first in that category, he would also win Athletic Ireland’s Mountain runner of the year award for this achievement. 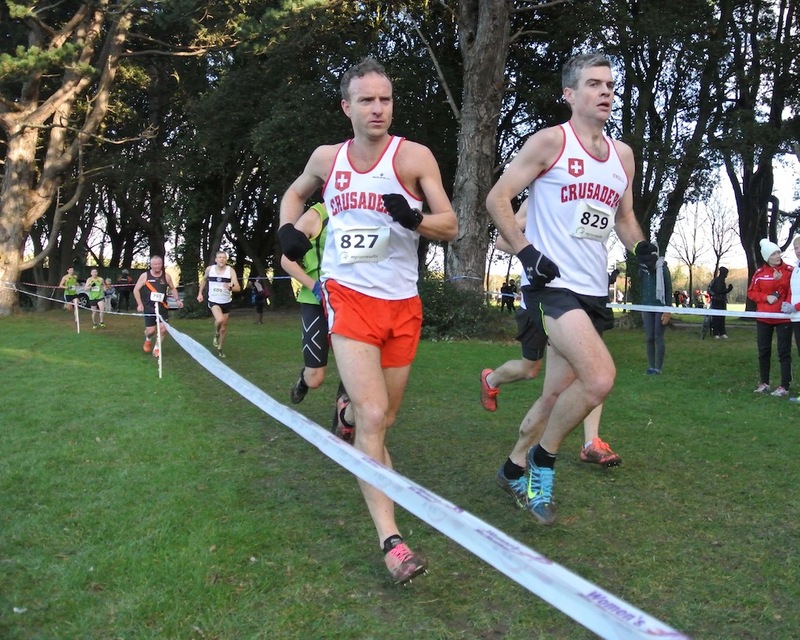 The peak race for this season was to be in 15 weeks time, the National Novice 6km in Waterford IT in December. My club Crusaders A/C had its biggest group of eligible runners since I can remember and everyone was in great shape and was targeting this race. 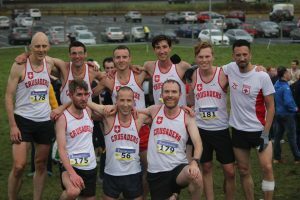 My goal for the Novice was to make the first Crusaders scoring team (4 from 10 runners) and hopefully a national medal. This was the longest buildup I ever had for XC and Rene was very pleased with the amount of time available! We could take it nice and steady and have lots of good races in between. XC training began in earnest as soon as I touched down in Ireland. I began to introduce regular early morning runs with Ann, just 3km at very easy pace to loosen the body out before the days main session and also get us up early to start our day. I love this time of year as not only do I get to train regularly with the club in the Phoenix Park on Saturdays but I also get to eat great lunches afterwards in the Visitors Centre! With 5 weeks of steady training under my belt I had the unexpected effect of supercompensation from all the hiking and my VDot levels started increasing with every fast session I did. This was my first race of the season. No expectations, just learn how to race again and get into the rhythm of short, fast racing, if anything, a benchmark for the rest of the season. Started out with John Mulvihill and Michael O’Connor but I eventually let those notions go on the last lap when fatigue really set in. Gasping and stumbling through the finish chute I thought to myself, “Ahhhh, I remember this feeling!”. Looking back now, I can see I was a minute behind clubmate Vinny (23:13) who unbeknownst to me I would eventually catch up with in my peak race of the season nine weeks later. On a course I hadn’t run before in the National Sports Campus, it combined the senior and masters all in one race which made for an interesting event as everyone had a bib number on their back and front with their age category so you could see who your competition was and depressingly for me every M45 and M50 runner that was passing me by! I had a steady race and made my way through the field as the laps progressed. I was about to pick off Brian Furey with a lap and a bit to go but he decided he wasn’t having any of that and took off. Clubmate Pablo Sanchez (Pabs) was trailing just behind me the whole way and smoothly took off on the finish straight as all annoying 1500m runners do! 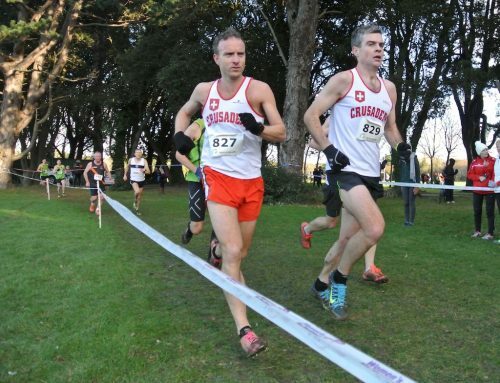 Clubmate Ciaran Diviney made selection for the Irish M40 XC team again this year, a great achievement! 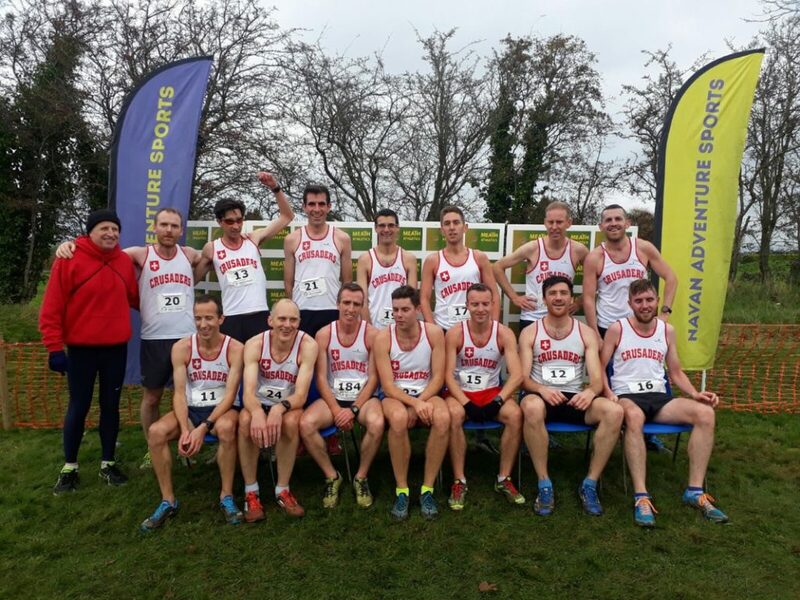 I was 1:57 behind Ciaran but would close this down by Dec. A great training race but still lots of work, and thankfully time, until National Novice in Dec.
A week later and we were back at it with two very strong Crusaders teams totaling 14 lads. Held in Navan on a course which I thought was brilliant, hills and meandering corners! It was on an old golf course which was now used for ‘Foot-Golf’ on the side of a long sloping hill. A course with about 12 corners to take per lap (36 altogether). With a competitive field of 108 club runners. A brief uphill start and then a long fast downhill, I started conservatively and made my way through the field. Elbows and spikes were flying and I even got a hefty shove from another runner who didn’t like my aggressive cornering style and I gained about 5 extra spots as a result (thank you!). 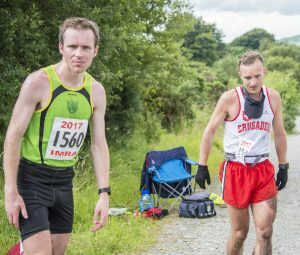 I was on Crusaders John Mulvihill’s shoulder for the first 3 kilometers with Vinny McGuinness not too far ahead either. John pulled away as I took the foot off the gas for some reason. By the last lap I had three lads to work with and I finished strong. Could have went out harder in hindsight as the downhill really helped more than I knew. Our A team won team gold (3rd, 5th, 7th, 14th), I was our 8th scorer. Our 5th-8th scorers would have been good enough to take team bronze (16th, 23rd, 25th, 33rd(me)). If we could keep everyone fit and healthy for the National Novice we would have a great shot at a National team medal. 3rd week of racing in a row. Was feeling quite strong and was progressing through the field nicely, I passed Michael Kiely (first time since National Novice 2015) and John Mulvihill, that lasted for about 5km before John passed me and I started to slightly drop off his pace. Michael subsequently pulled out of the race so it meant we didn’t have a scoring team in the end. 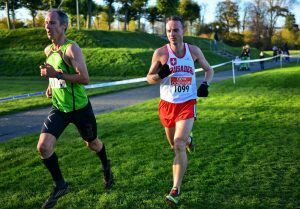 I had company with Rathfarnham’s Paul Flemming and another Raheny runner just ahead who usually pipps me. I was leading our small group until Paul turned the screw (see pic) with less than a Kilometer to go. I stayed on his shoulder until the last 300m and with no one close behind I conceded to fight another day as he sprinted with 200m to go. I took a few scalps including Brian Furey and the Raheny runner. 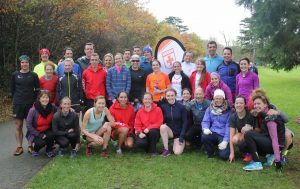 Another outing with a massive show from the club with over 30 runners from the mens and ladies sections. It was on a similar course as Dublin Seniors the week before. 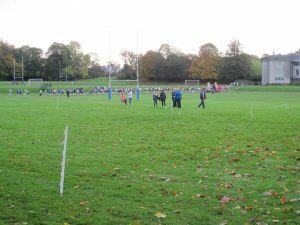 I ran with John Mulvihill…again, convinced I would prevail! Not to be, the course was pretty muddy and tough going. John can really grind out a steady pace, unfortunately he would have to miss the national novice due to a hernia operation. Karl Fahy won the race and Rob Cross in 5th. With two weeks until the National Novice I was feeling in great shape and this fast 5k race would make a great session to get speed into the legs. It was my first 5k road race since 2015 (Aware 5k, 16:35). I decide to go for a bold target, sub 16min (3:11 min/km avg). My actual splits turned out as 3:13; 3:18; 3:18; 3:16; 3:11 (Final Time: 16:16). So I only hit it once as you can see! I probably could have squeezed another 10 or so seconds had I not been such an amateur at the distance. I had planned to keep an eye on my splits as we went along but forgot to set auto lap on the watch. The opening KM felt OK but as we went up Chesterfield Avenue I felt the pace was slowing and saw my watch pace was saying 3:18’s. Not what I wanted and I felt the group I was at the back of was taking it easy, my inexperience at this distance was yet to show. After 1.5km I decided to push on (similar to what I did in Ballycotton) and catch a few runners ahead. 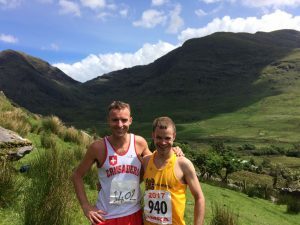 I unexpectedly found myself passing clubmate Rob Cross (15:57) and then Irish XC athlete Fionnuala McCormack (15:58), she was was using it as a session ahead of Euro XC the following week, it was at this point I should have known something was wrong! I found myself taking the headwind for the group of eight or so runners up the slight incline. Sli Chulainn’s Tim Grummell (15:52) and Gary Condon (16:15) then took the front and I was glad to be behind their big frames to block the wind. With 2.5km to go Fionnuala’s coach who was on the bike alongside casually said “Off you go now”, and she took off with the rest of the group in tow. I managed to keep a steady pace and really keep grinding through the pain but I couldn’t keep up with the group. I lost nine spots I think altogether and managed to just take two by the end. Still, it was a 19 second personal best and a great sign ahead of the National Novice. 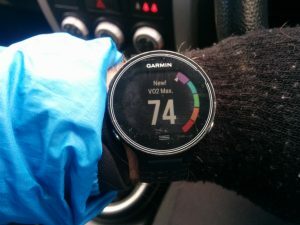 The Garmin VDot has been steadily going up all season (although I’m still very dubious on it’s accuracy until I can get lab tested) and it went up to a supposedly VDOT 74! The week before we had a final session on the ‘Munch Mile’ in the Phoenix Park. The plan was to run the session hard, rather than the controlled effort I usually do. I have two or three sessions a year which myself and Rene refer to as a ‘Hero workout’. I recorded my fastest splits on the Munich Mile hills ever. I was all set for the National Novice, 15 weeks of training to peak for this one race. We have been chasing a club team medal for the last four years and we have come 5th three times out of the last four years. Would this be our lucky year? I love it when a plan comes together…nearly! With such great depth this year in Crusaders my goal was to make the scoring ‘Crusaders A’ team and hopefully get a national team medal. With ten on a team with four to score, I’d have to upset the applecart of the usual standing among the lads but I knew I was peaked just at the right time. I was feeling very confident at the start of the 4 lap hilly course (116m) and I got a decent place when the gun went off, fast but not stupid fast. I figured I’d go out fast and then settle and grind out the rest of the race. The first two K’s were fast and I progressed through the field nicely. Then on lap 2 and 3 the pace went right down. David Power (Rathfarnham) was having a very good race and just went ahead of me on the hill of the 2nd lap. I stuck close and we were still taking places but the big hill was taking its toll on everyone. I began closing in on clubmates Ciaran Diviney and Vinny McGuinness who I’ve been behind all season, I passed Ciaran (who had been trying to hold a peak since October) at the start of the 3rd lap and kept digging deep and then on the 3rd hill I also passed Vinny who gave some needed encouragement to keep going. I got on Davids shoulder and went to overtake at the start of the last lap but he pushed on and I was chasing him all the way up the last killer hill. At this stage I was just concerned with not losing any places but a final surge saw me take another 6 places on the last climb. I left nothing in the tank and on the final straight I was dead on my feet and had no kick where I lost just one place. I had amazing support from Ann and clubmates all the way around the course. Unfortunately though, for the 4th time in 5 years, our club placed 5th. Our ladies team got a brilliant team bronze which we are mighty jealous of. We were down the on form Brian O’Kelly who had a 15:18 two weeks earlier, John Manion (shingles), John Mulvihill (hernia operation), Michael O’Connor and Pablo Sanchez (retired 2nd lap) all due to injury. We conservatively speculated in the post race analysis that had Brian scored for us we would have gotten a national bronze medal. It’s a lot of luck and timing to get everyone at one big event in good nick and precisely why a national team medal means so much to us! Our running joke in the team is “Definitely next year!”…and why not! So I probably need to shave another 30 seconds off my time to get a very respectable result next year. Maybe a year of marathon training for Berlin 2018 is just the thing to do that! 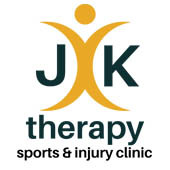 Neuromuscular Therapist in JK Therapy Sports & Injury Clinic specialising in running injuries and chronic pain. 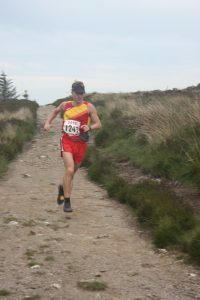 Running Coach, Mountain Runner and trail lover - Irish Mountain Running Champion 2015 & 2017. 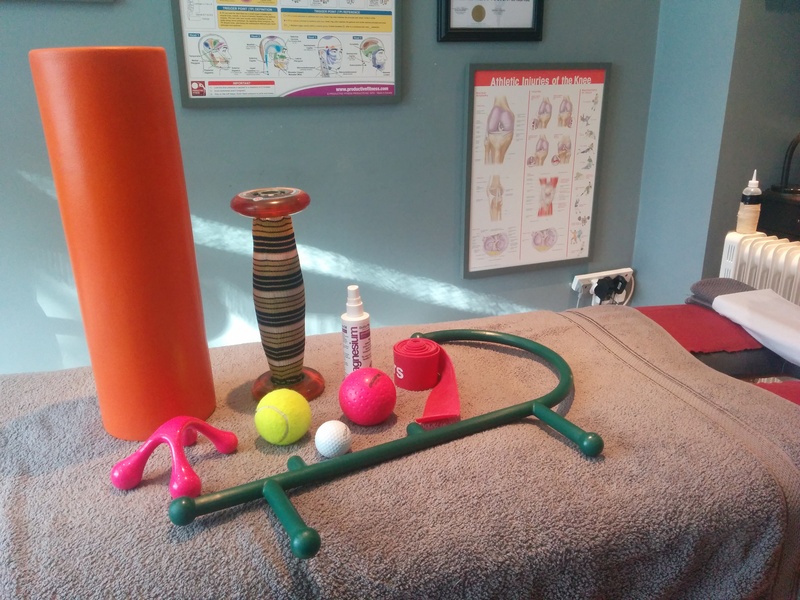 JK Therapy is a Neuromuscular Physical Therapy & Sports Massage Clinic located in Dublin. 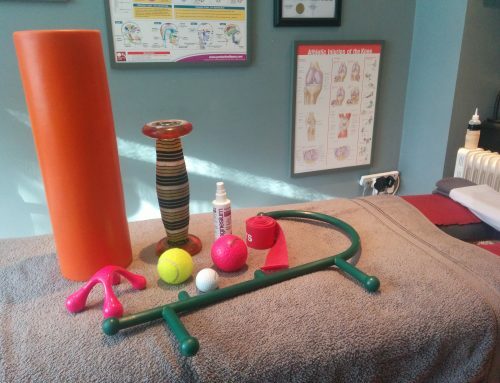 We treat sports injuries, chronic pain and work related injuries.